The Yamaha YZF-R1 has won the AMA Superbike Championship for the past six years in a row. 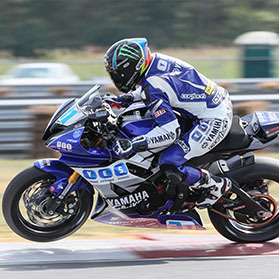 Last year, a brand-new R1 Superbike debuted in an all-new racing series--the MotoAmerica AMA/FIM North American Road Racing Championship--and it was business as usual for the Monster Energy/Graves/Yamaha Superbike team, which is headquartered at Yamaha Motor Corporation, U.S.A., in Cypress, California. The phenomenal string of success continued for Yamaha Factory Racing, with Cameron Beaubier and Josh Hayes winning all 18 of the season’s races and Cameron emerging as the 2015 Superbike Champion. For 2016, Cameron will defend his Superbike Championship, first and foremost, against his teammate Josh, who is a legend in the sport with four AMA Superbike Championships of his own, all won while racing a Yamaha R1. Can Cameron or Josh win again, to keep the Yamaha R1 winning streak alive for the seventh year in a row? Keep your eyes on the Monster Energy/Graves/Yamaha Factory Racing bLU cRU all season long. Rider Profiles, Event Schedule and Images at the bottom of this page! One of the most experienced and successful race teams in the MotoAmerica paddock, Yamaha Extended Service/Graves/Yamaha is operated out of the Graves Motorsports race shop in Van Nuys, California, in partnership with Yamaha Motor Corporation, U.S.A. Last year, team riders JD Beach and Garrett Gerloff won 10 of the 15 races on the MotoAmerica Supersport schedule, and JD realized his lifelong dream of winning an AMA professional road racing Championship. For 2016, JD will defend his 2015 MotoAmerica Supersport crown against a formidable field, which includes seasoned veteran and long-time teammate Garrett Gerloff. No two professional road racers have logged more seat time aboard the Yamaha R6 than JD and Garrett, and both riders are more motivated than ever. Look for JD’s #1 and Garrett’s #31 Y.E.S./Graves/Yamaha R6s out front all season long, competing and winning for the Yamaha bLU cRU. 2016 MOTOAMERICA Road Race Schedule. The MotoAmerica Road Race Series is sanctioned by the AMA and FIM North America. Yamaha riders will be competing in four classes: Superbike and Superstock 1000, which will race together but be scored separately, Supersport (the top 600cc class), and Superstock 600. Visit the MOTOAMERICA website for results and standings throughout the season.